wearing what looked like a green track suit. went up in the office. Thirty, maybe twenty, he was wearing a baseball cap backward on his head. Regardless, he had his audience now. There were the three cops in the first ESU unit, two helicopters, two harbor patrol boats, half the tourists in downtown Manhattan, and us. Why hadn’t he jumped already? we asked, handing the binoculars around. Why don’t the cops just grab him? They were three big guys after all. The one closest was sitting Indian-style right next to Jumper whose feet dangled over the tower. That cop was tethered to the other two guys and the bridge’s super structure. He could just reach out and boom. But Jumper just kept on talking, gesticulating—angry sometimes, sometimes morose. “He looks a little dingey,” observed someone in the office, handing off the binoculars to pick up a call ringing through on her desk. “We’ll have the meeting in five minutes,’ suggested someone else, wandering towards the water cooler. Soon thecurious crowd at the window thinned to just two of us. The P.D. had inflated a giant yellow and white mattress thingy on the ground below the parapet. Jumper just talked and talked. “He’s not going anywhere,” said the other guy at the window, walking back to his desk. “Five bucks says he goes,” I said. “You can’t bet on that,” said someone else looking up from her computer. I watched for a while longer trying to keep the binoculars in focus. Then I picked up the phone and called a friend in midtown. I explained the situation. “How long’s he been with the police?” asked the friend. “I’ll call you.” I said and hung up the phone. 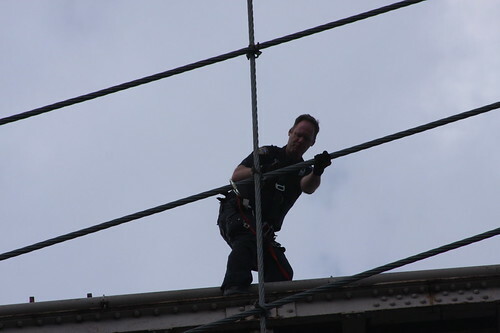 The afternoon sun was making it hard to see what was going on but the two cops supporting the negotiator were leaning on the railing on top of the parapet like they were on break now. Bored stiff I figured. Each had one leg up on the railing, the one with the hard hat on had his right arm slung like a wing over the top bar. The cop on point, squatting, stood up now and shook out his legs and Jumper just talked and talked. I took a call and made two. “Is he still up there?” a voice called from the conference room. Jumper must have looked down and seen the yellow mattress inflated bellow him. The Eastern parapet, the one in Brooklyn, isn’t in the East River. There’s a cobblestone park below it that’s quite nice to visit just after sunset when the skyline lights start to shine. Anyway, Jumper got pretty agitated and triedto scoot around the other side of the tower, away from the mattress-thingy. He did this on his belly and hung his legs out over the tower to show he meant business. The meeting in the conference room broke up and our windows were full as the three cops dropped to their knees and crawled towards him. He waved his arms wildly. We all made the same sound when he started to drop. A loud strangled gasp with a curse mixed in there. Jumper spun spread eagle, maybe three revolutions, before he hit an outcropping in the tower half-way down. He only made it half way, though. As he fell he hung pretty close to the granite (quarried in Vineyard Haven, Maine) that the tower’s made of. The ambulance guys are trying to figure a way to get him back onto the roadway right now. They don’t seem to be in much of a hurry, though. The three ESU cops are still on the top of the tower. One guy, I’m guessing the lead negotiator, seems pretty broken up. Traffic out of Manhattan is starting to pick up again, now. It’s just about rush hour. I must say, it tightened me up a bit watching him spin like he did.I sure wish I hadn’t made that bet. This entry was posted in Idle Hands, It's A Big World Full of People, Manny's Published Writing and tagged bad bets, brooklyn bridge, gambling, life before 9/11, regrets, suicide by Manny Howard. Bookmark the permalink.